No fair! Why should my character be dead just because the monsters rolled well and hit him for a lot of damage? They missed Joe’s (identical) character! This game is SO unbalanced! Wait a minute! Why should my character fall down into the demon pits just because I failed my reflex save to get clear of the trapdoor when Joe’s character gets away just because he made his save! That’s SO unbalanced! OK, that’s blatantly silly. The fact that most role-playing games use dice, and that they’ll influence the outcome, is stated right up front. This is like complaining that people get dealt different hands in poker. It’s a part of the game. If you get dealt a bad hand (whether figurative or literal) you just have to play cleverly to try to overcome that disadvantage – or fold and wait for the next hand. 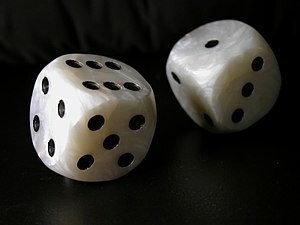 The dice, cards, or luck will generally even out in the end. Still, in at least one way, our complainer is right. His character is now at a serious disadvantage through no fault of his or her own. Of course, he’s also going to have the epic tale of how his character either escaped from or died in the demon pits, while Joe’s character will have the somewhat lesser tale of how he luckily didn’t fall down a pit and walked back to the tavern to get some dinner – UNLESS he voluntarily accepts the same disadvantage by going in after his friend. It’s succeeding – or failing dramatically – in the face of great odds that makes for exciting play and good stories. The bigger the disadvantage overcome, the better the story. Wait a minute! Why should my character fail to qualify for Ranger just because I rolled bad stats while Joe’s character gets to be a Ranger just because he rolled good stats? Rangers are way cooler than fighters! This game is SO unbalanced! And, once again, no it isn’t. The game started when you picked up the dice; making characters was and is a part of playing the game. Presuming that no one is using loaded dice, both players had exactly the same chances and options – but Joe made better rolls and now has some advantages. Our player with the ordinary fighter will just have to work harder to try and overcome those poor die rolls. But wait! What about “the dice will even out in the end” part?! How is that going to happen? Our player will be punished through the entire game for a few poor die rolls he had no control over! And there we have a pretty fundamental misunderstanding of how the first edition worked. Characters – and ESPECIALLY low-level characters – died a lot. Usually permanently. Unless Joe played very well indeed, his lovely attributes weren’t going to last too long – and even if he did play well, a few bad die rolls could cut him down. What, no one would ever take such risks? When the alternative is usually a lifetime of grinding poverty and an early grave anyway? Have you ever looked at the life expectancy of soldiers in some of the more dangerous jobs in World War I and II? It was actually a lot worse. Still, adventuring in first edition was so dangerous that it was fairly common for characters to retire, passing on the mantle to younger heroes because they no longer wished to take such risks – especially if they’d gotten hold of a large treasure or two. Old characters often moved gracefully into politics and raising families, emerging only when they were desperately needed. That was why they started getting strongholds and followers around level ten or so. The world was full of things for minor adventurers to deal with because the high-level characters had better things to do. The ever-doubling experience tables were a fabulous boon to new characters as well. If a first level character joined a tenth level group, they were likely to be handed some gear – and all they had to do was survive two or three sessions, and they’d be fifth or sixth level while everyone else was still tenth. In another two or three sessions they’d be ninth level – and they’d continue, at most one level behind, until the higher-level characters retired or were killed (in other words, usually not for all that long), in which case it was now their job – as a senior party member – to build up new characters. That way the group gradually advanced in level, even as individual members came in at first level and older characters died. Why would a low-level character join a high-level group? A first level character who joined that tenth level group had excellent odds of becoming tenth level themselves – far FAR better odds then they had of surviving spending years adventuring with other low-level characters. A chance like that was a fabulous opprotunity – and thus characters of many different levels often adventured together. Yes, new characters still died more often than older ones – but, just as in reality, a group that included some veterans passed on their skills to new recruits and kept a fairly high percentage of them alive. Why was your young mage growing in power so fast? He or she was benefitting from the lore passed on by that fabulously powerful tenth level magic user that he or she was hanging out with. Character’s didn’t need too much background either. A first level character might well have gotten out of his or her apprenticeship mere hours before. A second or third level character? Possibly a quick adventure or two, which they were lucky enough to survive. After all, you weren’t starting off as a grand hero, so you didn’t need to have your prior impact on the world evaluated, or to have a slew of enemies, or much of anything else. You were chronicling your attempts to survive and rise to prominence in your field, not how Captain Awesome became slightly more awesome. That neatly freed the game master from the problem of “where did this high-level character that no one has ever heard of before come from?”. It made simple survival really mean something – and it chucked a lot of the current worries about “balance” out the window. Everyone got the same dice, the same rules, and the same opportunities – which is about as perfect as “balance” gets. The price of those benefits was that you had to accept that characters died a lot. In fact, in the end, they ALL died – just like everyone in the real world. It was HOW they died that mattered. In a dramatic duel? Saving a village? Confronting a rampaging dragon and being part of the group that took it down? In bed with someone else’s wife? Having raised a family and seen a few terrified villages scattered in the wilderness become a prosperous realm under their guidance? A good death was a win. One adventurous and heroic life completed, it’s last page written, epilogue done, cover closed with a sigh, and placed on the shelf of pleasant memories to occasionally be pulled out again for a bit of reminiscence. A good ending washed away all the craven moments, times you got out of character, and other literary sins. Ignominious deaths were losses – and victory meant nothing unless you sometimes lost. Attaining grossly high level and running out of things to do due to game master exhaustion was about the worst way to lose of all. It meant that your characters story just sort of… guttered out, with neither a heroic end nor a “happier ever after” nor even an ironic twist. It hadn’t MEANT anything. It’s just as sad as when something like one child-character’s quest for his lost parents was never resolved. I’ve made lots of characters who were designed for martyrdom. Some died gloriously, and became in-game legends and fond memories in reality. Some, made for campaigns that never went too far, are lost in limbo, their tales unfinished. A few got hauled back into play by game masters who felt that “dying” equated to “losing”, and that heroic sacrifices should be rewarded – not realizing that a heroic sacrifice and a good ending was it’s own reward.